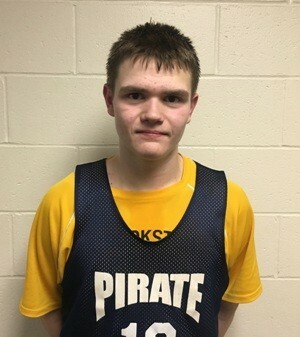 This week’s athlete of the week is Crookston Pirate Boys Basketball player, Caden Osborn, a 6’2 junior post player. Caden is having a great junior season averaging a double-double with 18 points and 10 rebounds per game. He is also averaging three blocks, two steals and one assist per game. He is coming off a 17-point 10 rebound game at Pelican Rapids on Tuesday night. Caden leads the team in field goal percentage making 121 of his 200 two-point attempts (61 percent). He also leads the team in Player Rating with a 431. Caden uses a mix of some muscle, his length, quickness and smarts to score and rebound in every game. Caden is a three-sport athlete and plays football in the fall. He is an offensive and defensive lineman for the Pirates and usually plays in the guard spot. He has played varsity football for two years. He is also a member of the Pirate Track and Field team in the spring and is a rare and unique combination of thrower/two-mile runner. Yes, you read that right. He participates in the shot put and discus and also runs the two-mile run! Osborn is also a member of the Leo Club, he plays the Viola in the orchestra and he is a member of the honor roll.